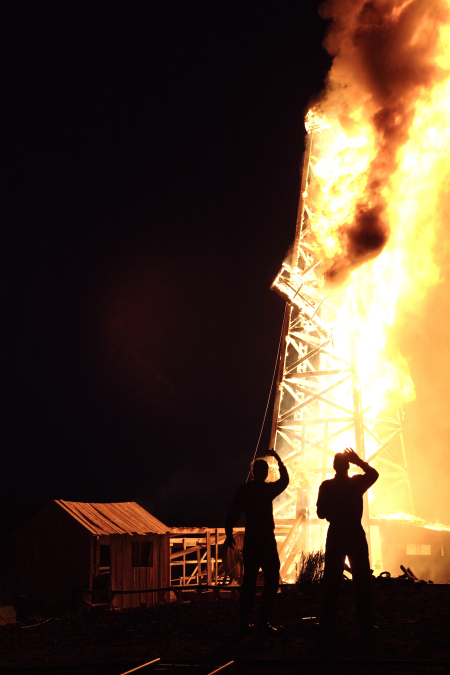 Though Paul Thomas Anderson's latest film, There Will Be Blood, is based on a book published in 1927 which dealt with the emerging oil business in Southern California, its underlying themes are just as relevant today. 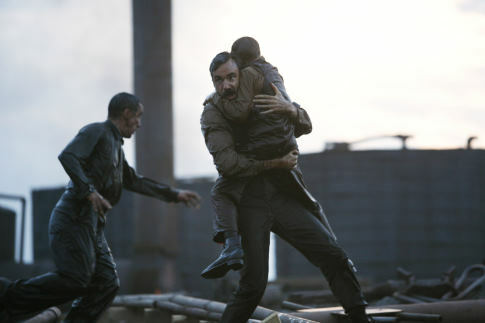 As characters such as burgeoning oil baron Daniel Plainview become richer and richer, stepping on all those around him, the film reveals how the lust for the black gold can and will corrupt anyone. Its obvious pertinence to current events becomes obvious as this simple story reveals itself. A remarkable film, it is the long-awaited screen return of director Anderson after several years' absence and is further proof that its star, Daniel Day-Lewis, is one of this generation's finest actors. Within this story about family, greed, and religion, other fine actors such as Paul Dano and Ciaran Hinds carefully embellish this world with their complex renditions of their characters. Having made only a few films so far, Anderson has nonetheless established himself as a respected creator who has made such intense and memorable works as Boogie Nights and Magnolia. 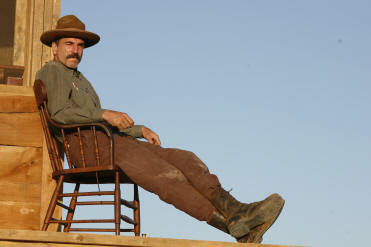 But with There Will Be Blood, Anderson has made a film that transcends his reputation for making wry quirky cultish films; he has now made one that should be called an instant classic. And thankfully the quartet of Anderson, Day-Lewis, Hinds and Dano took some time to discuss the genesis of a film that is going to be a magnet for this season's various award nominations. What was the inspiration and impetus to make a film based on this 1927 Upton Sinclair novel, Oil? Paul Thomas Anderson: The inspiration from the movie comes first and foremost from the book. I had been trying to write something, anything, just to get something written. I had a story that wasn't really working that was about fighting families, and it didn't really have anything. It just had that premise. When I read the book there were so many ready-made scenes, and the great venue of the oil fields and all that. Those were kind of the obvious things that seemed worth making a film about. The desire to work with Daniel, once that presented itself as a possibility, certainly drove the engine for me to write it and finish it and get it to him. 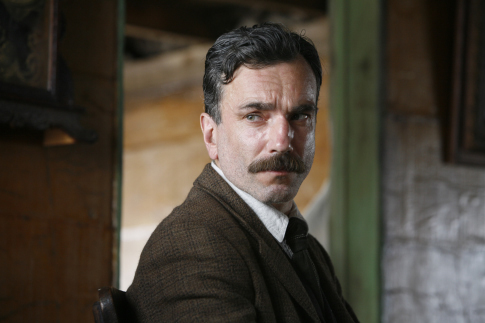 Your character, Daniel Plainview, goes through an arc of being miserable at the beginning and moreso at the end of the movie. What was the challenge in making this work? Daniel Day-Lewis: No challenge [laughs]. Paul Thomas Anderson: I think the arc goes like that [shows a descending line]. He goes from miserable to more miserable, hopefully. Daniel Day-Lewis: I never really saw him as a miserable prick, but� I don't know what the challenge is. The challenge, I dare say, is the same as it always is � which is to try and discover a life that isn't your own. And Plainview, as he came to me in Paul's beautiful script, was a man whose life I didn't understand at all. It was a life that was mysterious to me, and that unleashed a fatal curiosity which I had no choice but to pursue. Did you see him as descending into madness? Daniel Day-Lewis: He's just a fellow trying to make a living. I'm not really the best person to say this, but I believe you see the seeds of the man you meet at the end in the man you meet in the beginning. It never occurred to me to think that his journey was a short one. You establish a very interesting dialect for Plainview and sustain in the film. How did you go about creating that aspect of his character? 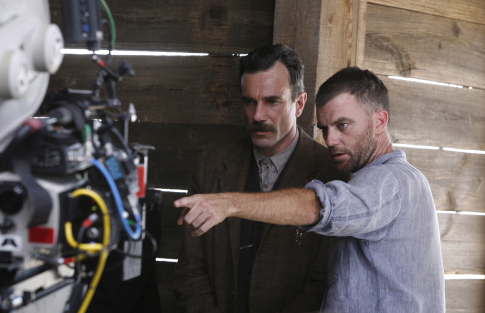 Paul Thomas Anderson: Well, the first speech in the movie is taken very directly from the Upton Sinclair book. "Ladies and gentlemen, I've traveled over half our state�" It was just incredibly simple; very direct. I can remember thinking, "Just keep it simple. Keep the language simple." I couldn't imagine these guys using more words than they had to use, anybody in this venue, which became a nice way to attack it. Ideally it gets to the point when it's just going well, you write something and wake up the next morning and say "God, who wrote that? That's pretty good." Paul Thomas Anderson: We ran it through a machine. It�s all digital voice stuff [laughs]. Did you model it on something? Daniel Day-Lewis: I did model it... I did this in a number of takes and a few people asked me about... [where it came from... think it's a little like John Huston's.] This [sort of thing] emerged over a period of time [until it felt right.] You do all the work yet these things take care of themselves without any decision being made. I tried to allow the voice to make itself heard and then once I hear it I try to make those sounds. You do it for a couple of months then it just leaves? Daniel Day-Lewis: Uhhh... Yeah� [laughs]. Paul [Dano]'s character has an underlying socio-political commentary imbued in him. How aware were you [Dano, Anderson, Day-Lewis] of the context of class warfare, religious issues, and other concerns of the time? Paul Thomas Anderson: Aware of it enough to know that if we indulged it or let that stuff rise to the top it could get kind of murky. It's a slippery slope, when you start thinking about something other than just a good battle between two guys who see each other for what they are. Just to sort of work from that first and foremost and let everything that is there fall into place behind it. Paul Dano: I would leave any of that for Paul to bring up in the film if that's what he wanted, but I certainly didn't look at it as anything more than a story and as something to try and tell. I think it would have been dangerous for me to worry about trying to bring out some political theme, something other than being truthful to the characters. Daniel Day-Lewis: I feel the same way. Daniel Day-Lewis: I totally understood you asking the question. In a way part of our job is to ignore any... The focus has to be narrower than that or selfish or introspective, to focus on a particular world and a very particular group of people telling a story within that world. Whatever greater significance it may have there's no harm in that... You leave that to the audience. Daniel Day-Lewis: You immediately then objectify it � which is a fatal error, the one thing you can't do. Going in to that personal experience you take wrong course and therefore you tell the story in a way that people can understand but it's an honest mistake to do that. If you stand outside of the story and have a little guess about what's going to happen, how it's going to be perceived, you stand outside of it; then you might well stay at home [if you do that]. Paul, what would you not let your lead actor do? Paul Thomas Anderson: Nothing! He was required to do it all. Daniel, how did you prepare for the physical parts of the role? Daniel Day-Lewis: The thing about those lads � when you discover Plainview at the beginning, he's almost learning himself how to do it. Anyone who can swing an ax or a sledge, which almost anyone can do, can dig a hole in the ground. In terms of the physical preparation there wasn't really anything to do except just stay fit and then just start digging holes. They kind of made it up as they went along. As you see in the story, before even cable drilling, rotary drilling, came into common use, they began by scooping this muck as it erupted naturally out of the earth, scooping it up in saucepans and buckets and stuff. That was the first way of gathering oil. And then someone had the bright idea of trying to set up an A-frame and to plunge the equipment of a telegraph pole down into the ground, to see if that would help it along. It's incredibly primitive. As the story progresses there's something to learn about, because the drilling procedure is a fairly complicated thing, but at the beginning it's sheer blood and sweat, really. Why did you choose a different title for the movie from the book? With its futuristic implications, were you talking about our own times as well? What were you trying to say about the impact of oil lust on human behavior? Paul Thomas Anderson: I changed the title because at the end of the day there's not enough of the book probably left to feel like it's a proper adaptation of the book. I'm probably selfish. I wrote the title down and it looked really good. I grew up in California, and there's a lot of oil out there. I don't live that far from Bakersfield, which is where the initial discoveries of oil were in California. They're still pumping away. I suppose I've always wondered what the stuff is, how we get it out of the ground, why we like it so much and what the story was. The story of oil in California in particular, and in this country, was really well-told in the first couple 100 pages of the Upton Sinclair book. He started to write the book in the '20s when he went with his wife to the Signal Hill area, which was essentially set up to be vacation homes overlooking the Long Beach bay. Somebody decided instead of building vacation homes it was time to start drilling for oil, and they struck oil. So this community went absolutely mad. When Sinclair witnessed this community trying to get this lease together, he said he witnessed human greed laid bare. He saw these people go absolutely crazy. He knew what he wanted to write about. And that's what started him on the road of that story. We just picked up where he left off. At the core of the story was the drive and ambition, not only from this independent oil man but also from the people that he was supposedly getting the better of in leasing their land. The ambition was on both sides. Did you cast Paul Dano as Eli/Paul Sunday [the twin brothers] because of his work with Daniel in The Ballad of Jack and Rose? Paul Thomas Anderson: It was, because the first time I had seen Paul was in The Ballad of Jack and Rose. I called Rebecca Miller [the director and Day-Lewis' wife] to tell her how much I loved the film and to tell Daniel how much I loved the film. But really the first question on my mind was 'Who the hell was that?' I thought he was so terrific. I think I had just finished writing the script, so I knew I had to find somebody to play part. I had originally, insanely though that we should have a 12 or 13-year-old boy. And that kind of seemed ridiculous. He certainly got a good recommendation from Rebecca and from Daniel. I had to meet Paul for myself to know, and it was pretty clear that he was a terrific young actor. I was very lucky. Paul, what research did you do for your role? Paul Dano: It first started with just trying to learn a little bit about the time period. I think whenever you're doing a period piece that's important, but especially, to me, sharing a lot of scenes with Daniel and how well he immerses himself within the period. I've seen him working, and it was something that I really wanted to pay attention to. I looked up some stuff about evangelical preaches, but I sort of had a privilege with Eli. He didn't have radio or television, and I don't think he had the opportunity to see a tremendous amount of preachers, except when somebody traveled through his town or a town close by. He didn't have a lot of books either, so I think he sort of made himself up once he found what his gifts and his savviness and charisma could bring him. I think that slowly took over in him. Through the words of the Bible and loving to hear himself talk, he found some way to be spiritually seductive via himself. As an actor, I don't know if it was an excuse on my behalf, but it was a way for me to run with the material that Paul gave me and not have to base it on one person or a group of people in particular, and sort of try to run with whatever instincts I had for the character. Originally Paul was only supposed to play the role of Paul Sunday, and then it was expanded for him to play Eli. What made you decide to do that? Paul Thomas Anderson: We had an actor, and it didn't really work out, and we had Paul, and he was in a small part. We though, "God, why is he in such a small part?" And then, better yet, maybe because of my obsession with East of Eden, I thought, "Well, they've got to be twins, right?" I had actually been talking to a friend at the moment that all this was happening, who was telling me about his twin brother. I thought it was too good to pass up. Paul Thomas Anderson: Yes he did. And I was too dumb [at first] to give him the part. In the New York Times profile on Daniel it came up that the other actor [who was to play the part] was intimidated by Daniel. Daniel Day-Lewis: I'm probably not the right person to speak about it anyhow. I was quite surprised when I read that comment. Whatever the problem was during that time with that particular person, I absolutely don't believe that it was because he was intimidated by me. I happen to believe that; I hope I'm right. Paul, what was your reaction when you found out you would be playing both parts. Paul Dano: [Deadpan] Double the pay. I didn't have a lot of time to think about things like that. I certainly didn't relish the idea of getting a bigger part in this film because of trying to throw myself into the character, and that was the priority. I have to say in retrospect, yeah, it was wonderful to get to spend some more time in Texas with these guys here. I feel very lucky, and hopefully I was able to contribute to it in so short amount of time. That was my main concern, to try and make a contribution without a lot of time to prepare. How did you all prepare for the three big confrontation scenes between Daniel and Eli? What went into filming them? Paul Thomas Anderson: First up is the reservoir. Daniel takes the first swing. Daniel Day-Lewis: It was a very difficult day, that day. Things weren't going right. People were doing all kinds of things to try and fix the pipe which needed to be working in the background, filling the reservoir. We lost a lot of a day in this place, which we just couldn't afford to do. Time was very tight. Essentially, out of the necessity often something interesting is born, and of course the tracking shot which covered the whole scene. We didn't know if we could make it work, because obviously with the hits, you have to get each right at the right angle. In a moving shot that covers the whole scene, the chances of getting everything right in that scene were really slim. So we attacked it like that, and there was nothing you could do to get ready for that except just try it and try again. Paul Thomas Anderson: And the next day we got to shoot the baptism scene, so Paul got to have his way. And that's a very similar thing, with one exception. We didn't rehearse it. We just knew where they would stand and had a couple of cameras rolling. We decided to get the scene before the slapping starts, and then we would start slapping. But Paul either forgot or decided to take his own initiative and slap Daniel across the face. Paul Thomas Anderson: That's a fog. That's two days of fog in a bowling alley. Paul Dano: It was fun. Daniel Day-Lewis: We actually shot that scene in the Doheny Mansion. Sinclair loosely based the character in his book, Oil! on the life of Doheny. So by second remove, there was also a connection there. It was this huge, great, gloomy pile. It was the pyramid that he built to himself with the wealth he accumulated. It's overseen by the Doheny Trust, and the Trust employs a very large army of people in extremely neat uniforms to watch every goddamn move that you make in the place. I don't know what they thought we were doing in there, but they seemed quite disturbed by the whole thing. We had already entered in a realm, and we didn't know one thing from another. It was very tight time � again, we had very little time to play with. The score is really interesting � like another character in the film. How did the score come to be? Paul Thomas Anderson: It sort of begins and ends with Jonny Greenwood. I suppose the good idea that I had [was] to ask him to do it. 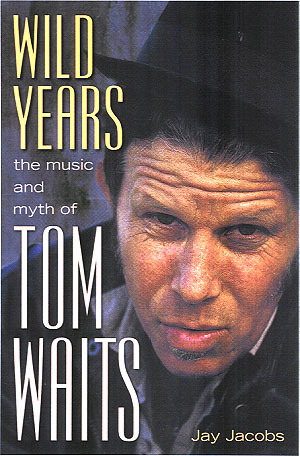 He had a couple pieces that existed before that he'd written for orchestra. He's better known for his day job; he's in a band called Radiohead. He has written a few orchestral pieces that I heard and thought were terrific. I had known him for a few years and asked him to do it, and showed him the film. He said "OK, great." I gave him a copy of the movie, and about three weeks later he came back with two hours of music. I have no idea how or when he did it, but he did it. It's kind of amazing. I can't say that I did any real guiding or had any real contribution to it. I just took what he gave us and found the right places for it. A couple of things that he'd written on piano that we then took to an orchestra, a couple things that he'd written for string quartet that just went straight into the film. We did that over the course of a couple months. It was a great experience working with him. Daniel Day-Lewis: Paul recorded the music at Abbey Road in London. The astonishing thing about Jonny is that he didn't study composition. I think he was a violinist, and then he went into the band and the band became his life. But somehow along the way he taught himself composition. He is the resident composer for the BBC Symphony Orchestra. He scored the whole thing himself. I don't know how he did it. Paul, you thanked Robert Altman in the credits. Did his film McCabe and Mrs. Miller have any influence on this film? 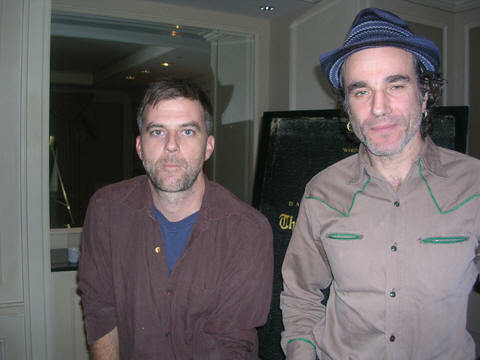 Paul Thomas Anderson: Well everything of Robert's films has been an inspiration to me. I saw his films when I was starting out, and McCabe and Mrs. Miller was certainly one them � Nashville, everything. All of them. We became pretty close in the last few years of his life. I got the job of sitting next to him on A Prairie Home Companion � for insurance reasons. My partner [Maya Rudolph] was in the film, and she was pregnant at the time. Just in case anything happened with Bob I was hired to sit there next to him. I can't tell you what I took from it. Obviously it was a privilege and an honor and all that, but just such an amazing good time. For 30 days, to sit next to him. Bob was very good at relaxing; he was a very relaxed director. I don't know if he always was like that. I think he might have been. I would find myself getting uptight about things, and he just sort of looked at me like "What are you worried about? It's all going to be fine." Maybe I learned that from him, to relax a little bit more. He died while we were cutting [There Will Be Blood]. I was planning to show it to him. I was in Ireland with Daniel working on the film, and I was planning to come back and show it to him and never got a chance to. That's really a drag that he didn't get to see it. So, yeah, we dedicated the film to him. What was it like to work with Dillon Freasier, the kid who plays the son, H.W. Plainview? 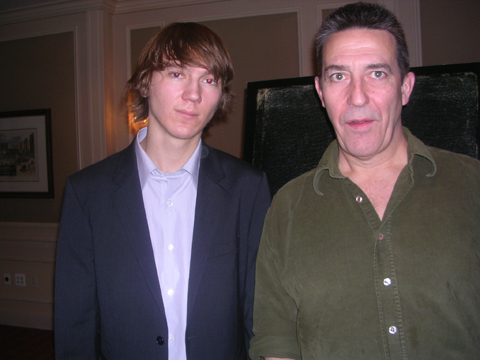 Ciaran Hinds: I joined just a bit later after the guys had started, and Daniel and Paul talked about this extraordinary young fellow they had found to play H.W. I found it to be a great joy � a very natural young fellow with a lot of natural cheek, but for someone so young, a lovely dignity. Daniel Day-Lewis: I agree with everything that Paul and Ciaran said about him. I felt very close to Dillon, I'm very fond of him. He's a cowboy, by the way. His father is a rancher. He's got his rodeo buckles. He's won numerous events. He does round-ups. He's the real thing. He has this strange maturity that's very unusual � something that a lot of kids his age might have in common in that part of the world. He's really used to hard work. He's got hands � you could knock out a horse with those hands. He's the most delightful person. He had that curiosity, as Paul was saying. Everything that was going on, every department, he was just constantly drinking in all this new information with such excitement. There was a moment � as we approached the moment when we were going to start shooting � I started to worry a little bit. We were quite close, we had a nice friendship, and I thought, "Man, how's he going to feel when I start treating him harshly?" So I thought I'd better have a conversation with him about that. I kind of sat him down and created this sort of portentous atmosphere. I said, "Dillon, you know how I feel about you. There are going to be moments in the next months to come when I'm going to speak harshly to you, I'm not going to treat you nicely. I hope you understand that I love you and so on�" And he looked at me like I was insane, like "Of course I know that." He was just one step ahead of us, pretty much most of the time. Paul Thomas Anderson: He just needed the go-ahead every once in a while. He had to struggle with Ciaran and he had to slap Daniel. He didn't like to do it initially. Daniel Day-Lewis: He developed a taste for it though. Daniel Day-Lewis: His mom just raised him so beautifully. She no longer is, but at the time his mom was a state trooper. She wanted to do things right and she thought she'd better check out this bunch of people that were going to be taking care of her son. She said, �I'll go rent a movie that fellow did.� And she went and got Gangs of New York. She was absolutely appalled. She thought she was releasing her dear child into the hands of a monster. There was a flurry of phone calls, and somebody sent a copy of The Age of Innocence to her. Apparently that did the trick. If we're to see Daniel's character as less than a monster, or more than a monster, it seems the relationship with his son is the key. How do all four of you understand his relationship with the boy? 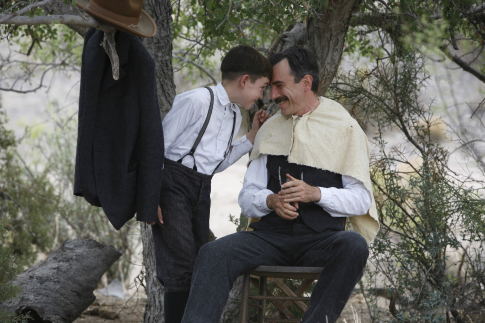 Paul Thomas Anderson: I think his relationship to the boy � I wish Daniel could have done better with illness. But the trouble that he has facing up to what happens to the boy. It would have been nice if he could have done better with that. Daniel Day-Lewis: You know, there's a real connection between those two. It's not pure exploitation, even though Daniel kind of taunts him later on, the idea of a cute face to buy land. Even earlier on there's a sort of joke made of it. It definitely goes deeper than that. The problem is that Plainview has no understanding of what the responsibilities of a parent are. His son is preternaturally responsible in a way that a genuine partner would be for the day-to-day running of his business. From Plainview's point of view anything that interferes with the running of a business is something that he has to take care of, for his son's sake as well. He doesn't know how to deal with this damaged creature. He's a child. He doesn't know how to be a father to him. He's a friend and a partner, but he doesn't know how to take care of him as a father. He has no means of knowing that. This film is being talked about for all sorts of awards. 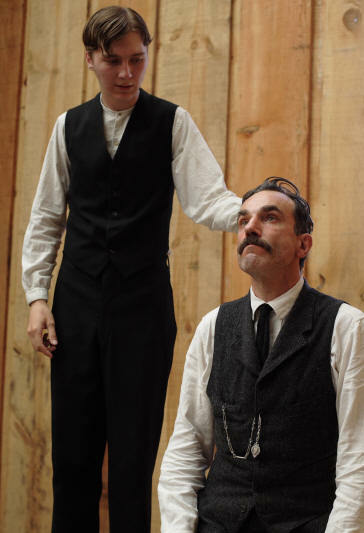 Daniel Day-Lewis: We are both in equal measures very excited and very nervous as well. We certainly understand the reactions we had so far that there are people that will go with us and others might not. There are a lot really good films out this year with wonderful work in them. So the main thing is to get it out there and hope people see it. When you do polarize people with a dark grim film like this then know you are having an effect. Daniel Day-Lewis: Yes, it's kind of nice. At least we know they're having a discussion [about it]. #1 � 2007 Brad Balfour. #3 � 2007 Brad Balfour. #5 � 2007. Courtesy of Paramount Vantage. All rights reserved. #6 � 2007. Courtesy of Paramount Vantage. All rights reserved. #7 � 2007. Courtesy of Paramount Vantage. All rights reserved. #8 � 2007. Courtesy of Paramount Vantage. All rights reserved. #9 � 2007. Courtesy of Paramount Vantage. All rights reserved.